This is a pretty comforting stat for the team at Stack Overflow - they’re the go-to home of almost everyone that works with code on the planet. 32.5% of respondents claimed they check Stack Overflow ‘daily or almost daily’, 31% check it multiple times a day. A further 22% check the site at least once a week. This is something we’re well aware of at Packt - developers are autodidacts. That’s probably partly the nature of working with software that can be so changeable and the nature of developers themselves - curious and exploratory. 86.7% of survey respondents taught themselves a new language, tool or framework outside of any formal setting. The fact that formal education is so rarely sought or provided for explains the fact that so many developers write code outside of work. 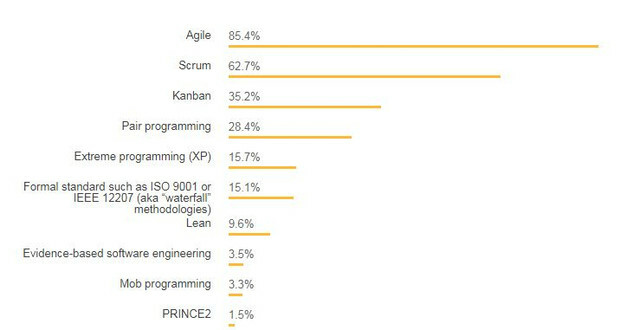 Stack Overflow’s 2018 survey reports than more than 80% of developers code as a hobby. This was a sure thing - and the survey stats prove it. 87.2% of respondents reported Git as their version control tool of choice. Despite murmurs online that it’s unnecessarily complicated (the search suggestion next to ‘why is Git so popular’ is ‘why is Git so complicated’), thanks to its powerful scalable features and, of course, the dominance of GitHub in the lives of technical people, it’s become a core part of developer life. We know just how popular Python is at Packt. We joke that we should just be the Python Publishing Company. This year it has risen above C#, after last year rising above PHP. Where will its rise end? Or, as more and more people need to write code, will it become the de facto language of technology-powered professionals? TensorFlow was 2018’s most loved tool with more than 73% of developers using it expressing a great deal of enthusiasm for it. Clearly its delivering on its tagline: ‘machine learning for everyone’. If TensorFlow is the most loved tool, we also weren’t that surprised to see that React is massively in demand. 21.3% of developers who don’t currently use it expressed an interest in using it. Node.js was in second place with 20.9%. The love for TensorFlow must be getting out there as that came in third here, with 15.5% of respondents interested in developing with it. It’s not hard to find someone complaining about Visual Basic online. The ecosystem is widening, and there are far more attractive options for developers out there. Microsoft are even self-consciously changing their strategy with VB, as this post from last year outlines. Stack Overflow reports that this is the third year in a row that Visual Basic has come out as the ‘most dreaded’ programming language, meaning people using it ‘express no interest in doing so’. 34.6% of survey respondents changed jobs less than a year ago. A further 22% changed jobs between 1 and 2 years ago. Like technology itself, change is a constant in the lives of many developers - for better and worse. No surprises here - these methodologies have become embedded in the everyday practices of millions of developers.